Buy excellent quality spiral slicers at RawMID.com -- the best online shop for health products. Spiral slicers are becoming more popular as more and more people discover their amazing convenience in cooking. These simple devices are also called zoodlers, or spiralizers. Despite the simplicity and affordable price, for some people they become an irreplaceable tool for healthy diet maintenance. Searching for spiral slicers? Get a smart offer from RawMID.com! Tired from the same old foods? Want to try something new without getting an empty pocket? A spiralizer won`t change the taste of vegetables and fruits, but it surely will give them a form in which you want to eat them again and again. The working principle is easy: by turning the handle, crunchy vegetables or fruits are going through the knife and turning into long noodles, pasta or curls. With no electronics on board, spiralizers are the cheapest way to bring something new in a raw foodists choice. 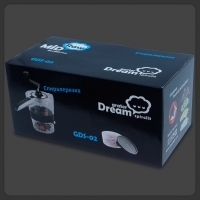 Dream Spiral Slicers are well-designed, so you can process the right quantity of fruits and vegetables quick and easily. Extra blades help to add more functionality -- you can choose the shape and thickness of the spiral for using in various ways. Buy Great Quality Spiralizers Today! Spiral slicer is a useful tool in everyday cooking. Created with help of a spiralizer, these healthy meals leave a great impression on those who try them for the first time -- you would never believe how tasty carrots or zucchini could be! Raw vegetable pasta with lots of vitamins, minerals and fiber is an alternative to a common pasta. It is a great thing for raw foodists and those who want to replace high-calorie meals with light and nutritious dishes. Spirals from your favorite fruits and vegetables are perfect to use in a dehydrator. Original way to make salads and try new raw food recipes. Beautify the main dish with spiralized vegetables – your guests will be pleasantly surprised! Spiralizer can be used for hard fruits and vegetables: apples, carrots, potatoes, onions, cabbage, zucchini, beets, ginger and similar. Where to Buy High Quality Spiralizers? 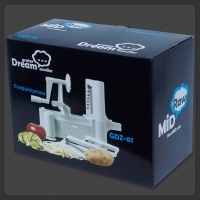 Dream Spiral Slicers are handy and reliable – they are there to give an excellent experience in raw cooking. Brought by RawMID, an expert in tools for healthy living! Our online store offers the most interesting models of spiral slicers. Great prices, high quality and best customer reviews make them so attractive to healthy food lovers. See our reviews and choose a preferred delivery and payment method! Spirolit Spiralizer will help you to create delicious and healthy meals in just few minutes! Want something special without much effort and time wasted for cooking? Spirolit Spiral Cutter allows you to make vegetable pastas – delicious meals with lots of vitamins and few calories. Spirolit is sui..
Zoodler is a helpful tool for raw foodists, vegetarians, and all those who aims to lose weight with no stress! It is irreplaceable for making raw zucchini pasta, which has gained popularity for its similarity with original noodle pasta. Zoodler Spiral Slicer can turn firm fruits and vegetables (l..